Auction activity across the combined capital cities is expected to decrease this week, with 1,527 properties scheduled to go to auction, down from last week’s 2,350 and also lower than one year ago (2,230). Week-on-week volumes across Melbourne and Sydney, the two largest auction markets are set to fall considerably this week, with 724 homes to go to auction across Melbourne and 533 scheduled auctions in Sydney, down from 1,226 and 811 last week respectively. Across the smaller auction markets, volumes are also set to decrease across the remaining capital cities this week. Victoria has the busiest suburbs for auctions this week, with 13 properties set to go under the hammer in both Epping and St Albans, followed closely by Glen Waverley (12), Reservoir (11) and Thomastown (10). Last week, the final auction clearance rate was recorded at 74.0 per cent across the combined capital cities, increasing from the week prior when the final clearance rate fell below 70 per cent (69.8 per cent). 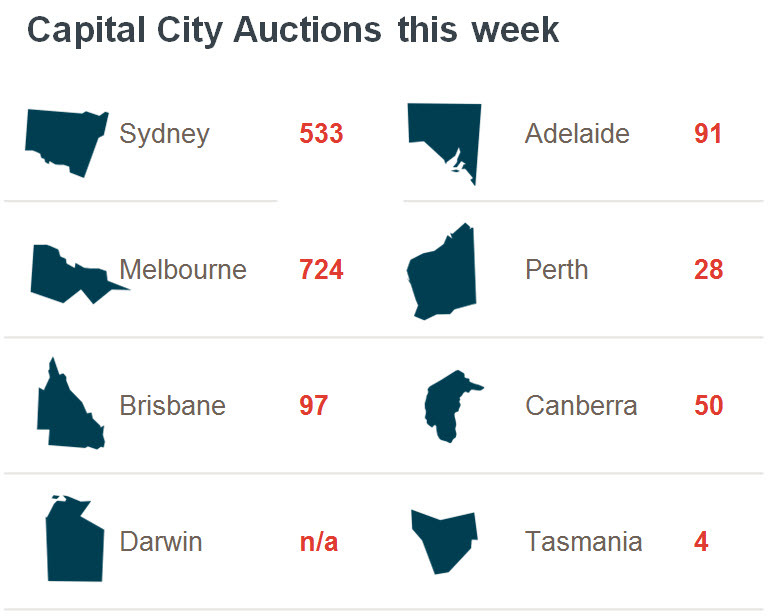 Auction volumes also increased week-on-week, with 2,350 capital cities auctions held, up from 1,751 the previous week, however lower than what was seen over the corresponding week last year (2,675). Across Melbourne, volumes increased last week with 1,226 auctions held and a success rate of 78.1 per cent, higher than the week prior, when 75.2 per cent of the 828 auctions cleared. Both volumes and clearance rate also rose in Sydney last week, when 811 properties went to market and a final clearance rate of 74.3 per cent was recorded, rising from 72.4 per cent the week prior across 596 auctions. Across the remaining capital cities, clearance rates improved in Adelaide, Brisbane and Perth, while Canberra and Tasmania’s clearance rate fell over the week. Across the non-capital city regions, the highest clearance rate was recorded across the Geelong region, with 72.1 per cent of the 56 auctions successful, while the Sunshine Coast region held the highest number of auctions (78).